Over the past few years the spam filters engines really gotten so good in both , filtering the emails before throwing them out and even catching them in spam before they reach out the inbox. The problem lies in faithful decision by the email senders, small business owners and are the like to punch out an “email blast” or fill their readers with marketing contents. These appears as legitimate and warranted marketing, but are considered negatively by the readers all that too making them mark as spam. Who wants to become a Spammer ? Obviously neither We and perhaps nor You! And even nobody else in this world. But, what if when you write and prepare something for your customers and accidentally it gets caught by their spam filter. Being an accidental spammer can harm you and your business more than anything because in this case you’re intentionally getting spammed, even you’re not aware that when you converted from their favorite to their spammer. Spamming is the most unpredictable thing you can ever see in marketing. Lots of stuff can make you counts as spammer. All that can happen for you to be considered as spam is that you have sent an email to someone who doesn’t want it or for a filter to caught you up as spam. That’s it but yes how to get prevented from it? 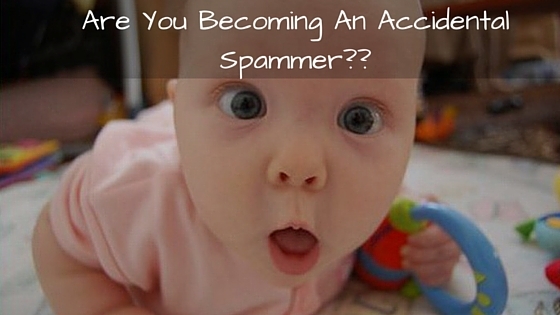 How To Avoid From Being An An “Accidental Spammer”? You never prefer to talk a stranger man right? Because we are taught since our childhood that never talk or trust any strangers because we don’t them, you don’t know where they belong to and what they aim. S, how can you expect from you customers that if they don’t know then why they would like getting messages from any stranger. Let your customers know who are you with your address, so that they they can build a trust for you. Never lie your readers, which includes misrepresenting yourself before them, either by your address, your identity or sliding with email headers. If someone is not interested reading about you never compel them after all you’re not going to win any championship by filling their inbox or perhaps spam box. Besides this, what we feel that you should never ask anything more rather than customer’s email I.D to perform the whole unsubscribe process. Make sure that you’re sending to those who wants to receive from you. Take permission through an opt-in or even better than that go for double opt-in — for every customer who is signing up for your services send an email to thank them for getting subscribed and also informing them that to confirm the subscription they have to follow the further process, but try to make the process as short as possible. This will maintain the rely of your customers over you and your email will become worthful for them. A client came to us with a problem that he was helpless because his single opt-in of his regular newsletter is getting higher but his double opt-ins were getting failed. After the investigation we found that his second opt-ins are getting marked as spam. We were not sure what was happening actually, but when we checked his header we found that the sending address of him was a constant contact address. Believe me this is more severe than an email deliverability issue. If you’re sending emails from an address other than your domain address then it may becomes the issue for confusion for your customers, and probably even can make them mark your email as spam. There is no doubt in this that getting attached or working with spammers can mark you as spammer as well. Getting attached with spammers means advertising for those who spam or those who are known spammers. Always remember to maintain a perfect ratio of image: Text and never even try to put an invisible graphic which means images with invisible tracking address. Invisible content can also lead to you become a spammer . Questions like “How can we avoid being an accidental spammer?” Can be a running king of header, remember that the emails with “[company name] monthly newsletter” tends to be the highest open rates. Make sure that you are avoiding the spammy characters or languages. Now jokes apart, a regularity and constancy is always better than an irregular one. Sending a whole bunch of emails at once can make your users to run away from you when they will find their whole mailbox filled by your mails. Even if you’re sending any email from a long period of time and then you are sending again after that long break can cause your customers to forget about you and your company.Maintain a perfect schedule and stick to it.